Though golf may be our expertise, our dining is second to none. 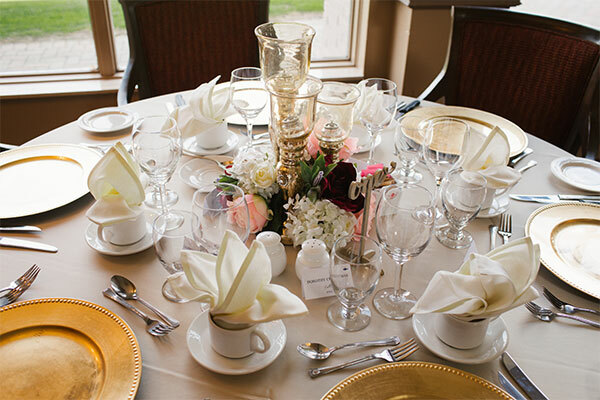 Pointe West is pleased to offer Banquet and Catering Services and our open concept clubhouse design and dining room can accommodate 200 guests; the perfect venue for hosting tournaments, weddings, showers, or gala dinners. The patio overlooks the 18th green, offers a view unsurpassed in Essex County and is the perfect place for an outdoor wedding ceremony or cocktail party. The Club’s experienced staff are pleased to customize a menu and agenda to suit your requirements. Dining and Catering…With views almost as stunning as the Bride…. As a Private Club, Pointe West is only available to its Members and their Guests for regular dining. The Club does however offer Social Dining Memberships which are now more attractive than ever! The Culinary Team at Pointe West is a creative force that will tempt your senses and taste buds! The All-Day Fare Menu will provide you and your Guests with a one of a kind dining experience! For private events, the Club’s Catering Package is certainly just a starting point. Executive Chef, Vanessa Parent and her talented Culinary Team can customize a Menu based on all tastes and budgets! At Pointe West Golf Club we are happy to accommodate any dietary restrictions or food requests. Click on the button below to view and download the All-Day Fare Menu. Click on the button below to view and download the Club’s Catering Package and contact the Clubhouse Manager, Iolando Antogiovanni at 519-736-8623 Ext 15, or by email at iolando@pointewestgolf.com today for your personalized event! Our Clubhouse Manager, Iolando Antogiovanni, will assist you with every step along the way. Please contact Iolando at iolando@pointewestgolf.com for any additional information. Pointe West understands how stressful a special event can be but we’re here to make is easier for you with helping you create and allowing your vision come to life. We truly believe Pointe West Golf Club offers a truly unique wedding location experience. From an outdoor wedding ceremony on the covered patio overlooking the signature 18th Hole, to an intimate single level Banquet Room which allows you and yours guest to enjoy the ease of being together in one beautiful room. But it doesn’t end there, Pointe West offers the perfect location for any photography to capture those forever moments. Our Clubhouse Manager, Iolando Antogiovanni, will assist you with every step along the way. From choosing a delectable menu to working through all the details of your special day. Please contact Iolando at iolando@pointewestgolf.com for additional information. Pointe West Golf Club will assist you every step along the way to make sure your day is perfect!